You must make reservations at least 5 minutes in advance of the time at Mom & Dad's Italian Restaurant. and email catering@momanddadstally.com to place orders. Mom & Dad's Italian Restaurant has been an iconic restaurant in Tallahassee for over 50 years. The authentic italian atmosphere is full of friends and family enjoying the delicious recipes passed down through generations. Please ask to see our Special Dessert Menu! Take It Home - Don't cook your sauce for Hours! Take our famous sauces home! The baked mushroom appetizer was delicious but we had to ask twice for bread to dip into the yummy sauce. The red sauce was much improved and very good but they were stingy. Now I have leftover pasta and no sauce. We enjoyed the meatballs and sausage. The blue cheese salad dressing had no chunks of blue cheese. The wine choices were delightful. Enjoyed the experience once again. The quality of service, food and ambiance has been consistent with every visit we have made. Mom & Dad's remains one of our favorite go to restaurants in Tallahassee. Wonderful service. Yummy food. Great time and nice place to celebrate. We were told the management would honor the past Monday night special of Italian dinners with free wine. Not the case. Only selection of the 2 for $30 was prime rib.....who goes to an Italian restaurant for prime rib? Also the “free” wine was nonexentant. The waitress was not accommodating as well. We’ll think twice before returning. The food was good as usual, but the service was outstanding! The service and food were excellent as always! The ambiance was great for a group of friends bein gable to chat over a delicious dinner. Had the lasagna which was delicious. Large portion. Loved their bread. I ordered the Tuscan Ribeye and they brought me a sirloin instead. This is the second time. My wife ordered the same thing and she got a real ribeye. Nice reception at the door. Got a table in no time on a Wednesday. Food and service were excellent. Rest room was spotless. Enjoyed the food and atmosphere! I will be back. The service on average is probably better than my experience this one visit. I think the kitchen may have gotten behind or we had an inexperienced server. It just took a bit longer than average. One of our orders was wrong when brought to the table. Food was good, just a couple of errors with service. I would not expect this on average. Mom & Dad’s was a Tallahassee institution with amazing food that made you feel like you stepped into an Italian grandma’s kitchen. I was excited to see the beautiful new space and verify the restaurant and recipes were the same. The service was great, everyone was amazingly friendly and warm, and the space was great! Sadly, either it was a realllly off night, or the food changed dramatically. The meat sauce that used to be so good I would drive frozen quarts back to Atlanta to last me until the next trip was watery and had very little flavor. It used to be thick and meaty with full fresh basil leaves in almost every bite. I only leave this because I hope they’ll find a way to be more true to the recipes everyone loved if they have access to them. Or make sure there’s more consistency if it was an odd night. It was really a special place, and I think everything else I saw there means it could be again! We thoroughly enjoyed the Early Bird Special on a Wednesday night, eating outside in lovely weather. With $2 off a glass of wine during Happy Hour, and delicious salad, bread, and entree for under $20, the meal was delicious, plenty to eat, and an exceptional value. Coming a little early at 5:15 on a week night kept the noise level very low, which is helpful as my friend wears hearing aids and the background noise can be very disruptive. Our waitress was friendly and helpful. We will definitely make Early Bird Specials at Mom and Dad's a regular routine! Nice enough restaurant but it certainly gives a better appearance than experience. Disappointing given the prices charged. Certain dishes were bland (Alfredo, marinara), meatballs did not taste homemade, and the cheese bread was not good (no crunch/no texture to the bread). 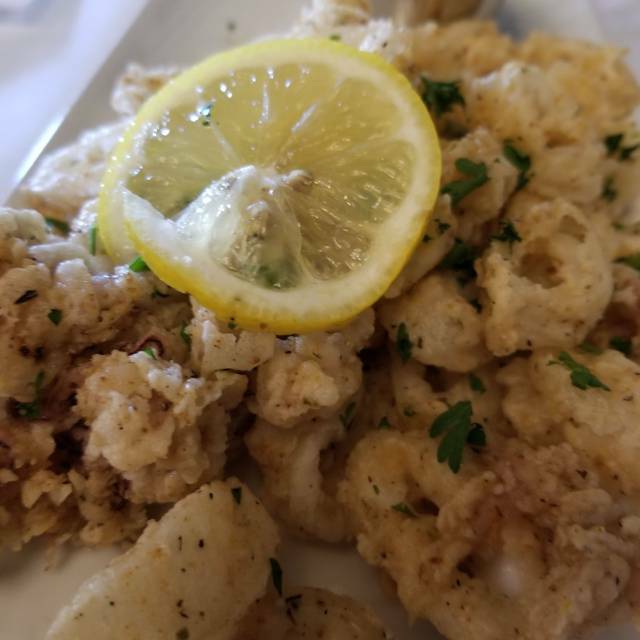 On the other hand, the calimari appetizer was excellent. One of the best I’ve had. And the eggplant Parmesan was also good. We sat outside and our server seemed to forget we were out there. She was not attentive and seemed rushed when we did see her. Drinks and wine were ok. No complaints there. Very good experience, as usual! Good food. Ambience was good as well. The radio was a bit loud and the while the staff was friendly , they were unattentive and service was slow. I would always recommend them to all my friends and family. Wait staff was aloof overall, our server was friendly and knowledgeable, but not attentive and very delayed in filling drinks or responding to table needs. Food took a good while to be served but was delicious. Won’t be our first choice for a nice “date night” dining experience. I ordered lasagna and it was barely warm when brought to the Table. Our server was good and the restaurant was nice but I won’t go back. Every time we go its wonderful. The staff is super friendly and professional. I recommend this resturant to all. Food was adequate. A couple of the meals lacked flavor. Service was great. Fantastic food,huge selection,great ambiance,great staff,attractive area,reasonably priced,superb. Food was good but not great. I miss the original Mom and Dads but this is a good place. The restaurant is very nice inside and the staff friendly and accommodating. If I were to compare this to other Tallahassee restaurants I may give it another star. Excellent - we had a great time and will be back. Thanks! My wife and I try to go to Mom & Dad's once a month or so. We love the food variety, quality and price. We went with a couple that we've known for many years three weeks ago and took my daughter and her husband last Saturday. I've never been disappointed. I was dining that evening with my date for the first time. The evening was perfect in every way. The violinist was very talented and had a good sense of knowing when to linger by for a moment or move on. The price was right for the quality of the food and the experience. I would say to any guy that wants the first date to be rememberable you need look no further than Mom and Dad's off Bannerman. Waiter was new and confused. Veal was tough and chewy. Portions very small. I ordered Veal piccata and side pasta served in a red sauce. For price not a good experience. Food and service was great! The atmosphere was relaxed and comfortable. My girlfriend and I went on Valentines Day for the second year in a row and it was delicious! This year they had a violin player walking around playing music and it was a very nice touch. The service and food was great and the kitchen got the food out relatively quickly for how busy the restaurant was. We will definitely go back! Great food. Great experience. Super wait staff. Busy night but still great experience. An excellent experience. The food was timely and the drinks were indulgent. The atmosphere spoke to a grace that a classy evening deserved. I had the blackened salmon and broccolini, delightful. My date had the snapper in a white wine cream sauce, we were both jealous and shared. Food wasn't even as good as Olive Garden and it was way over priced. I was really disappointed. Service was slow, waitress repeatedly forgot things. Wouldn't go back. Stuffed eggplant was awesome, crispy and hot! Great portions and excellent service! The last time we went to Mom & Dad's was when it was still on the Parkway. On Tuesday, our party of five (my husband, his parents, our son and me) dined here and while the food and service were excellent, the pricing is off. The chicken Marsala has a rich, brown sauce laced with wine. The chicken was moist and tender, and the sauce delicious, but skimpy on the mushrooms. My side of angel hair with marinara was satisfactory; however, I wasn't expecting the green peppers in the sauce. The Caesar salad I started with is one of the best I've had - garlicky, anchovied dressing with a generous sprinkle of Parmesan on top. While stellar, it was an additional $3 for soup or salad with entree. Add that to $19.99 for the entree, and you're up to $23 for dinner. My husband had the baked chicken Parmesan, and said he'd have it again. Baked, with no breading or frying beforehand, it was a "lighter" way to enjoy this classic. The chicken was moist, sauced, and had ample mozzarella cheese. It was served atop angel hair with marinara. As presented, there wasn't much sauce, and our server noticed and offered a side of sauce. Our son had the kids spaghetti and meatball. He devoured the meatball, but wasn't a fan of the sauce or spaghetti: He didn't like the flavor of the sauce (I think the green pepper threw him off), and said the spaghetti was too soft. My mother-in-law enjoyed her vegetable lasagna. Loaded with veggies, there also were noodles and cheese. Interesting enough, my son liked this dish better than his own. My father-in-law has the penne a la vodka with sausage. The sauce was a perfect blush, and there wasn't a morsel left in the bowl. Overall, a very pleasant experience - atmosphere, service, and food quality are excellent. The vibe and pricing definitely are more in line with an upscale, special occasion dining destination. Mom & Dad's is consistent. I've tried most of their menu items and never been disappointed. I had the veal chop with a side of fettuccini alfredo, and the house salad. The salad was a good sized salad with ample dressing, the veal chop was fantastic, cooked to perfection, and the fettuccini alfredo was a perfect combination of noodle and alfredo sauce. Needless to say I was quite satisfied with my meal as was my wife who had the sauteed shrimp. We were visiting in Tallahassee and went there with family. Our reservation worked perfectly and we were seated immediately upon arrival. The decor was attractive and our conversation was easily heard, despite a large group nearby celebrating a birthday. We were not impressed with the service. We ordered Caesar salads with the anchovies on the side; salads came with anchovies right on the greens. The server didn't know what a carafe of wine was and kept calling it "a graph of wine". We ended up ordering a bottle of wine. Water glasses were empty more often than full. The server did bring the bill when asked but was scarce throughout the meal. The food was good but I wouldn't say excellent. I ordered their fried Chicken Parmesan following a recommendation but I was disappointed. The chicken was fried too long and made it dry. The breading was bordering on burned. My husband ordered the Chicken Picata and he was very pleased. I tasted his and wished I'd ordered that! It was full of wonderful flavors, covered by a tasty sauce and garnished with capers. The other two in our party had fried Chicken Parmesan and baked Chicken Parmesan. The baked version of the Chicken Parmesan was devoid of breading but looked better than my fried version. The chicken breast seemed moist. Dessert was Spumoni ice cream and it was OK but nothing special. I couldn't find any nuts in it but there were large cherry chunks. We had fun at the dinner but it was more due to the company than the food and service. I might go back next time we are in town but I would order something different and hope for a different server!! We enjoy Mom and Dad’s. It’s a nice casual dining experience. The food is always consistently good. Our server was great and helpful. Our food was out in great time and it was great.